The Netdev 0x13 conference took place last week in Prague, Czech Republic. 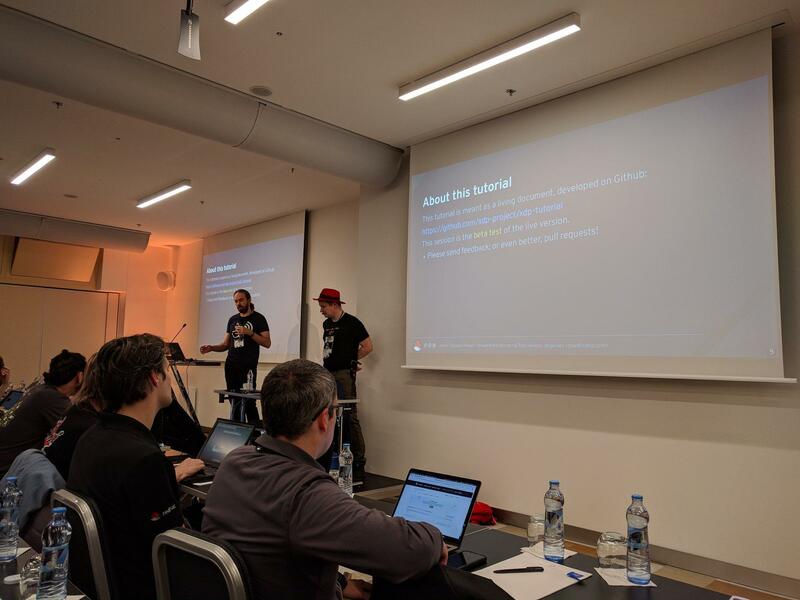 As we work on a variety of networking topics as part of our Linux kernel contributions, Bootlin engineers Maxime Chevallier and Antoine Ténart went to meet with the Linux networking community and to see a lot of interesting sessions. It’s the third time we enjoy attending the Netdev conference (after Netdev 2.1 and Netdev 2.2) and as always, it was a blast! The 3-day conference started with a first day of workshops and tutorials. We enjoyed learning how to be the cool kids thanks to the XDP hands-on tutorial where Jesper Brouer and Toke Høiland-Jørgensen cooked us a number of lessons to progressively get to learn how to write and load XDP programs. This was the first trial-run of the tutorial which is meant to be extended and used as a material to go through the XDP basics. The instructions are all available on Github. We then had the chance to attend the TC workshop where face to face discussions and presentations of the traffic control hot topics being worked on happened. The session caught our attention as the topic is related to current subjects being worked on at Bootlin. Being used to work on embedded systems, seeing the problems the Network developers face can sometimes come as a surprise. During the TC workshop, Vlad Buslov presented his recent work on removing TC flower’s the dependency to the global rtnl lock, which is an issue when you have a million classification rules to update quickly. We also went to the hardware offload workshop. The future of the network offload APIs and support in the Linux kernel was discussed, with various topics ranging from ASIC support to switchev advanced use-cases or offloading XDP. This was very interesting to us as we do work on various networking engines providing many offloading facilities to the kernel. The next two days were a collection of talks presenting the recent advances in the networking subsystem of the Linux kernel, as well as current issues and real-world examples of recent functionalities being leveraged. As always XDP was brought-up with a presentation of XDP offloading using virtio-net, recent advances in combining XDP and hardware offloading techniques and a feedback from Cloudflare using XDP in their DDOS mitigation in-house solution. But we also got to see other topics, such as SO_TIMESTAMPING being used for performance analytics. In this talk Soheil Hassas Yeganeh presented how the kernel timestamping facilities can be used to track individual packets withing the networking stack for performance analysis and debugging. This was nice to see as we worked on enabling hardware timestamping in networking engines and PHYs for our clients. Another hot topic this year was the QUIC protocol, which was presented in details in the very good QUIC tutorial by Jana Iyengar. Since this protocol is fairly new, it was brought-up in several sessions from a lot of interesting angles. Although QUIC was not the main subject of Alissa Cooper’s keynote on Open Source, the IETF, and You, she explained how QUIC was an example of a protocol that is designed alongside its implementations, having a tight feedback loop between the protocol specifications and its usage in real-life. Alissa shared Jana’s point on how middle-boxes are a problem when designing and deploying new protocols, and explained that an approach to overcome this “ossification” is to encrypt the protocol header themselves and document the invariant parts of the non-encrypted parts. A consequence of having a flexible protocol is that it is not meant to be implemented in the kernel. However, Maciej Machnikowski and Joshua Hay explained that it is still possible to offload some of the processing to hardware, which sparked interesting discussions with the audience on how to do so. The Netdev 0x13 conference was well organized and very pleasant to attend. The content was deeply technical and allowed us to stay up-to-date with the latest developments. We also had interesting discussions and came back with lots of ideas to explore. Thanks for organizing Netdev, we had an amazing time!